In the center of our Milky Way galaxy is a supermassive black hole. We can’t see this black hole directly because there is too much dust in the direction of galactic center, but radio waves can penetrate that dust, so we can observe the radio signals of hot stars and gas near galactic center. We’ve been observing these signals over several years, and we’ve noticed how the stars near galactic center orbit the region very quickly. From their orbital motion and a simple use of Kepler’s laws we can get a pretty good idea of the mass of the black hole. It turns out to be about 4 million solar masses. While this is a huge black hole, most of the stars orbiting it aren’t too terribly close. So for the time being they aren’t at risk of being ripped apart by the intense forces near the black hole. But there was one object recently that did make a very close approach. This particular object is known as G2. 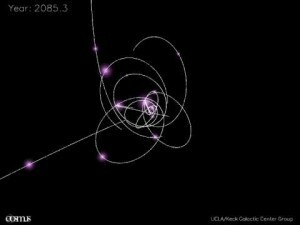 First discovered in 2012, its projected orbit would take it within 36 light hours of the black hole at closest approach, which is only about 1,500 times the diameter of the black hole itself. 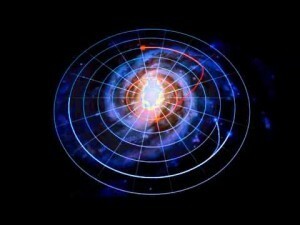 At this distance the tidal forces of the black hole would likely rip G2 apart. This caused a great deal of excitement, since we’ve never seen a black hole destroy an object. 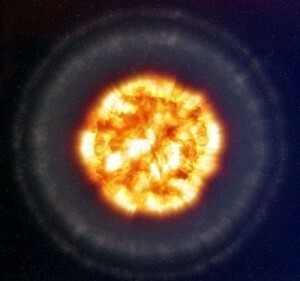 Initial studies of G2 seemed to imply that it was a gas cloud of about three Earth masses. It was difficult to be sure because we can only really see it by radio wave emissions. Such a cloud would easily be ripped apart by the black hole, so studies focused on observing the process in action. Even early on we could see that the cloud was being disrupted as it approached the black hole. But this Summer when the object made its closest approach, it didn’t rip apart. The latest observations, as published this month in the Astrophysical Journal, have shown that G2 remains intact. This is not only surprising, it means that G2 is nothing like what we thought. A diffuse gas cloud would have been ripped apart, so G2 can’t be diffuse. From the latest observations it seems to be a bright star surrounded by a thick region of dust. So how could we have been so wrong about G2? Part of it could be due to the thick layers of dust around the star itself, but at radio frequencies the dust shouldn’t affect the brightness too much. So the authors propose another solution. Perhaps G2 has been a close binary star, and these stars have recently merged into a larger and brighter star. The close orbit of G2 with the black hole could even have accelerated the merger process, through something known as the Kozai mechanism. If G2 is a recent merger, that would explain both the level of dust around the star as well as a dimmer than expected appearance. So rather than ripping G2 apart, the supermassive black hole in our galaxy may have worked to hold G2 together. So, I’m a complete physics neophyte. In other words, I am utterly fascinated by physics but very little about it. That said, I was intrigued by your use of the word ‘merger.’ Do stars actually merge in the sense that they combine into a single entity? I mean, it sounds like a terribly violent proposition when speaking about a pair of massive furnaces powered by nuclear fusion. I honestly never imagined that stars could actually merge. Great blog and keep up the great writing! Yes, stars can merge. It would be a rather violent interaction before things settled down. i too know nothing of physics so naturally im a bit confused. it seems according to this article that these stars merged while it was close to the black hole, but like jared said, wouldn’t we have had a clear indication of this? it seems like this is just a guess at this point. or did the black hole act to squeeze these stars closer together brightening it up a bit? couldn’t it also have survived if it was still in the early stages of star development? i imagine it would be rather compact even before becoming a full fledged star. i think i just need before and after shots to see what is going on here. Take a red and a blue taper and embed them in the centre of a larger white paraffin candle, about 1 inch apart, then light them both. At first you will have two separate flames and different colour shallow melt-wax pools. As the wax between them softens and melts and the two pools grow to feed increasing flame size while forming a larger sort of two-lobed pool with colour streaking, the two flames will start to bridge in to one another as a much larger multi-headed unstable [violent?] flame that quickly melts more taper and surrounding paraffin. If you watch closely you can actually see the melt wax surface ignite over the space between the two enlarged flame sources. Finally, as the melted wax pools continue to grow larger, deeper and merge to encompass both wicks and tapers and some surrounding paraffin, the wicks will slump closer together and you end up with a single flame, larger than either of the originals but smaller and more stable than the bridged flame and the shape of the melt-wax pool will become more circular, somewhat smaller than the combination of the two, and purple coloured. So, stars can be the size of the Earth. Because you said it was 3 Earth masses, so if it was a binary that means one of them was close to the size of Earth, OR, something is messing with the ability to measure sizes of objects in an area that has high gravitational forces, and of that is the case, would that also mean what light speed is being affected? Also, how are stars NOT distorted or elongated?